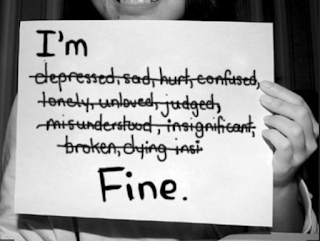 Pip Wilson bhp: " I'm FINE " ........ I asked a question online. I call my questions BECOMING QUESTIONS.
" 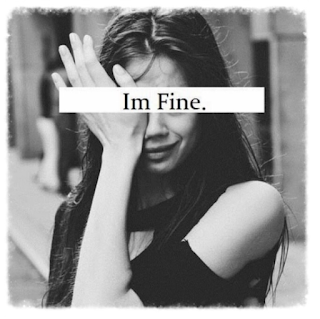 I'm FINE " ........ I asked a question online. I call my questions BECOMING QUESTIONS. Instead of saying a cliche - ‘Fine’ or ‘Good’ etc..
Can you think/plan & decide to use a new different word - even another cliche word? I asked if they would write to me, via an email, telling me the story of what happened? These are two of the answers I received. So today I answered I'm feeling full of anxiety and am very stressed this opened up conversation with my brother about, our past, stuff that happened in our up bringing etc, stuff that we both did with our kids that we felt ashamed about. Right now in my life, it is far easier to duck this kind of a question. How to actually get the words out? The poor folk are possibly only being polite after all! Is it actually fair to keep people who know and love me at arms length? And what about people who don't know me? I'm giving them a bland and a not very realistic impression of who i am. So having ducked this question for ages, i intentionally gave it my very best shot and chose a weekend when i was far away from my home town to practice. On the basis that if i sounded an idiot then at least in all probability i'd not be seeing those people again. "FullaStuff" was the nearest i could get. 'Coz i am, full of stuff that is. There is just so much going on right now in my life. It's mostly all good, change and new starts in lots of parts, massive No Entry signs in others, new grandchildren, elderly parent situations, relatives dying. So i took a big breath and used the new cliche word at each and every opportunity, as asked. It had a remarkable effect and one that i wasn't quite ready for. What could have been "Hi, Bye" occasions turned into conversations and on two occasions total strangers wanted to settle down for chats, serious chats about serious matters. Reflecting on this still causes me to feel vulnerable, scared almost. I think that at this time i don't want to say anything that could be misconstrued as saying how i really feel. Because right now i don't know how i feel. And maybe I'm one of those people who takes time to process emotions, maybe there are so many emotions swirling around that i can't unpick them all? My email is on my website home page www.pipwilson.com - see CONTACT. I will not reprint/share your answer. It will be totally confidentially to me. Challenges are great for our soul - more difficult the question = more growth for us humans! PS A book was published with 15 different Questions and answers from about 60 beautiful humans.